Scuba Diving in the chosen islands of Andamans under the able guidance of expert divers offers a mesmerizing experience. The deep blue sea looks lighter and brighter with the filtering sunrays. Corals flourish till the depth sunlight can reach underwater. The vast conglomeration of coloured fishes, big and small, needle like and disc like, the little families of clown fish shyly peeping out of the sea anemones all together create an enchanting fairy world of its own. The deep mix of violet and indigo clams that shut determinedly, while you float past them, transports you to a fantasy land of marine life of animated graphics. The sensation of being inside the light blue waters, the faint sunlight peering down from above and the thrill of spotting something enchanting at every step of the undulating coral reef baffles you and enchants you. The miniature shoals of colourful fishes swimming in animated thick bunches flicker and frolic like electric shockwaves changing direction from one side to another. The body of the fishes glisten with the reflected sunrays. Rains do not affect underwater diving much. The calmness of the seas and the tides play havoc with the visibility range affecting underwater diving. Sunny or cloudy also does not affect scuba diving. But winds do affect diving. As the seas get rough due to wind, visibility decreases. Scuba diving needs you to put on a diving suit that is body fitted and prevents water from entering inside and keeps the divers dry even underwater. Guided dives along the beautiful reefs of the Elephant Beach leaves you amazed and wanting for more. Scuba Diving with the certified friendly and experienced instructors can be really fun. The experience is magical and breath-taking. It will be a collection of cherishing moments to be treasured for the rest of your life. For the first-time divers, the experience is mesmerizing and leaves you in a trance. You would dream of going back into the warm blue waters and relive the charm of the underwater world. 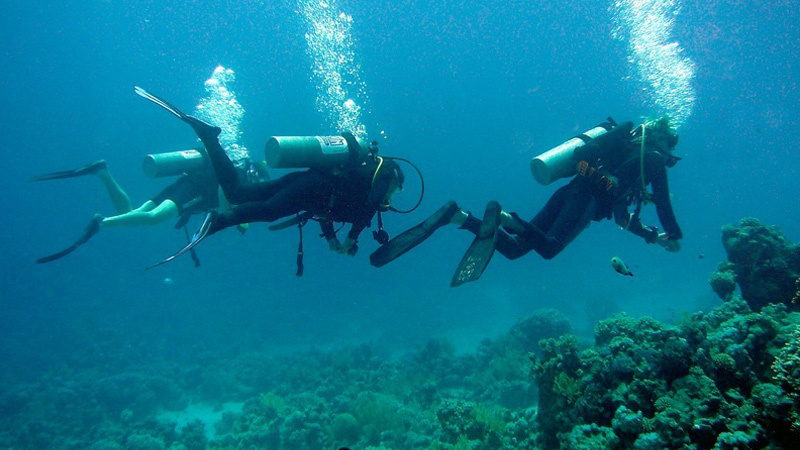 Children and adults alike can go for scuba diving. You can also do it in groups. It is a wonder how efficient and knowledgeable the instructors are. You won’t even feel the pressure of the water while you are cruising deep down. The instructors guide you on how to conduct yourself while in the diving excursion. You are to maintain a distance of certain feet from the lively creatures and you are not supposed to touch anything howsoever tempting they are. The divers are extremely caring and look after your comfort very closely. They ask you repeatedly whether you are comfortable. They take you to the depths depending on how comfortable you are breathing in from the mouth and breathing out through the nose. This technique sometimes becomes challenging for the people attempting scuba diving for the first time. At the completion of a successful Scuba diving trip, you even get a certification. The certificate lends a sense of achievement and you feel happy to have undergone a lovely and unique experience. Professionals and scuba divers are trained to take up the vocation of scuba diving in the waters of Andamans in these coastal areas. Barefoot Scuba is the most recognized training centre in India operating in these parts of the water. Safety of the guests is of premium importance and the diving instructors cater to safety methods very stringently. Diving is offered in multiple locations that includes Havelock and Neil Islands and also safaris to the North Andamans. Scuba diving in the busy site of North Bay Island, Port Blair, can be extremely joyful. The instructors guide the tourists well and brief them expertly on the scuba diving techniques to make them feel comfortable inside the waters. The scuba diving agencies surprisingly are very aware and conscious about environmental conservation methodologies. In spite of these diving sites being so popular and attracting such a lot of tourists from all corners of the earth, the diving facility providers take ultimate care to conserve and protect the coral reefs and the animals that are sheltered in the waters. The Andaman seas located remotely about 900 kilometres from the mainland of India is one of the hidden treasures among all tourism destinations of the world. The islands do not boast of glitzy pubs, bars, discotheques, brilliant and bright nightclubs and shopping malls, fancy hotels and man-made glory on earth. On the contrary, it is gifted with abundant and unending natural beauty and splendour. The coral reef is replete with joyful and colourful marine and beautiful and rare varieties of corals. The coast off the shores of Neil Island is an exemplary scuba diving site and attracts a lot of tourists from all across the world.